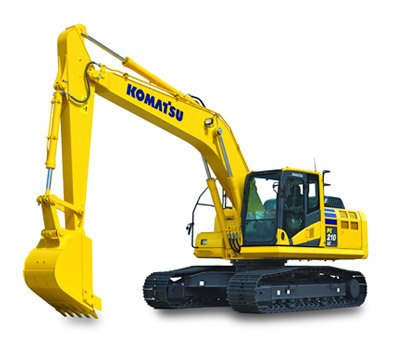 Looking to rent a construction class excavator, Komatsu – PC 210 LC-10, in Rochester NY, Ithaca NY and Western New York? Overview: water cooled, 4 cycle direct injection. Horse power (net) = 158 hp. Exceptional Diesel Particulate Filter Captures +90% of particulate material. Operating Weight = 48,950-52,036 pounds. Bucket Capacity = .66 to 1.57 cubic yards. Digging Depth = 21 feet, 9 inches. Maximum Reach = 32 feet, 5 inches.